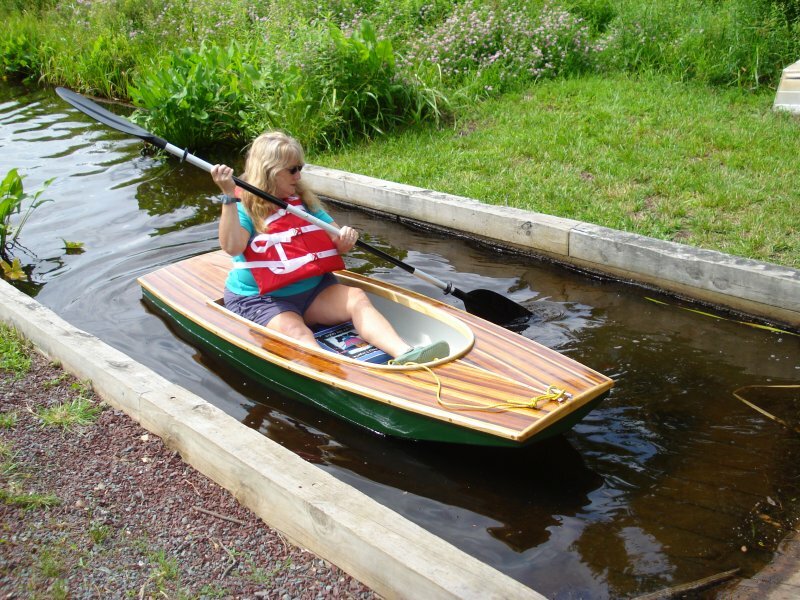 This 7'10" pram/kayak was built from plans in Gavin Atkin's Ultrasimple Boatbuilding, in spring of 2011 by Stephen Nickles, and launched this past June, my brave wife Christine is at the helm. Slight alterations from the plans are slightly flared sides, closed, arched, cedar stripped deck, ash rub strakes and laminated coaming, floorboards, and "West System" on outer hull only, weighs about 43 lbs. Made from 1 piece of luan mahogany plywood ( $9.00 ) and the rest scrap wood. The epoxy & 6oz. cloth were the only real expense, stitch & glue technique was used, (my first), and it will cruise in the lakes of eastern PA. It has ample buoyancy, is stable, and tracks very well, and best of all, it fits inside of our SUV.